The Fairfax County Board of Supervisors today appointed John S. Butler as the county's next fire and rescue chief. Butler succeeds Chief Richard Bowers, who retired in April. Butler’s appointment is effective Sept. 1. 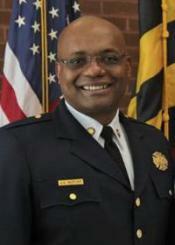 During his tenure in Howard County, Chief Butler expanded services, hired the most diverse firefighter/paramedic trainee class in the department’s history, helped establish the first and only local affiliate of the International Association of Women in Fire and Emergency Services (iWomen), established numerous community outreach programs, led the construction of several fire stations and improved service delivery and response times.